Ever since I started this project I’ve been a little afraid of Alaska. It’s so big, so far. So full of uncharted territory. “The last frontier” as they say. Between the cold temps and detachment from the lower 48, it just wasn’t high on my list of 50 states to run in. And while I sometimes like jumping into daunting adventures (oh hello, California) something about Alaska had me scared. Similar to the way I feel about other things I want—like a life partner or being a successful writer—but am a little bit afraid of, I needed a push to fulfill my dreams. I needed a push to Alaska. I just wanted somebody to send me there. And then one day, somebody did. It seemed the stars were aligning: somebody was sending me to Alaska. Even cooler, in the short window of time I had available to run a 5K in Juneau before my cruise set sail, the town was sponsoring a color run our company CEO was running in. Even though I don’t usually go for 5K races (exception: New Mexico) the race and the company was too serendipitous to skip. So I boarded a plane to Juneau—layered in running clothes and white shirts as a canvas for the color and hoped that the cortisone shot I’d received two days before for my nagging plantar fasciitis would kick in just in time. It was a cool, gray day in Juneau. I waited at the starting area with two guests on the cruise and a handful of crew members who’d come down for the race. My foot felt good. Actually, better than it had in months, but running on pavement would be different. When the gun went off, runners tossed handfuls of colored dust in the air and set off. They quickly separated into little packs, including the CEO and the crew, and soon I was running alone. There’s not much to Juneau before the big cruise ships arrive, so all of a sudden things became quiet. And even though I always listen to music while running, I decided not to that day. Maybe I was hoping for a chance to visit with the CEO or just wanted to get a jump on the UnCruise “unplugged but completely plugged in” experience. And that was ok. Kids passed me in bursts of energy. We stopped running at every traffic light because the race was so small there weren’t any police to block off the route. I passed closed tourists shops, gold-rush themed saloons, sculptures of fish and fishermen, and a few stations where Juneau residents politely threw colored dust in tiny handful directed below our shoulders. I finished alone, pain-free. Then I ran into the CEO and we walked back to the cruise hospitality suite together. He took me through the bar where the crew hangs out and the one shop that was open that has always been “good to UnCruise.” He pointed out the old mines in the hillsides outside of town and stopped to say ‘hello’ to the captain who would be leading my cruise. Like the run, the walk was quiet, causal, and easy. I could go on about everything I experienced on my trip—from boot-sucking mud to the “white thunder” of calving glaciers—but most of it will end up in marketing copy for UnCruise Adventures so you can look for it there when you’re booking your next 7-14 night adventure cruise. What I haven’t put into marketing copy is what eerily relates back to my yearning to connect with what is “real,” or at least real to me: On my cruise I met two architects, two writers, a professor, a lawyer, a salesman, a real estate agent, a personal trainer, an art conservationist, a dentist, and a Presbyterian minister. It was like stepping into a child’s picture book of “the people in your neighborhood.” I didn’t meet a single person who worked in tech. Not that they weren’t there, I just didn’t meet them. And not that tech isn’t real, because it has created, supported, and sustained my life in a very real way. But it was nice, restorative, to be away from using it and talking about it for a week. The last night of the cruise a bunch of us lingered at the bar (sans phones, of course) for an impromptu talent show. The architect rolled his tongue. The yoga teacher touched his tongue to his nose. The minister made a swan out of a dish towel. And the personal trainer challenged the salesman to a burpee challenge and popped through the ceiling tile in a burst of surprise and laughter. When someone swore there was bioluminescence over the bow, we ran outside to check it out. Norman Greenbaum’s “Spirit in the Sky” played on the stereo and I lowered my head, tearing up with joy. If the ship had gone down that night, I would have died a happy woman. These are the moments, friends. And we must, we must, get out of our schedules and phones to have them. Admittedly, I am very lucky to have had the opportunity to go on this adventure: to finish my Alaska 5K and walk through Juneau with the CEO of a company I love working for, to step in the softest, cushiest forest ground made from years of isolation, to taste fresh seaweed and hold a starfish in the palm of my hand. And I am grateful. Going without internet can be scary. Uncharted territory can be scary. But the experiences and people we want in our lives are most often the ones we push away because (maybe) we are afraid of what might happen if we actually got them. We might be happy. We might have nothing—or at least not as much—to complain about. We might be fulfilled. I wouldn’t have gone to Alaska the way I did if one day, when I realized I was unhappy at my previous job, I hadn’t run home from work and—still in my running clothes—sat on my balcony and looked for jobs. I wouldn’t have gotten that job if someone at UnCruise Adventures hadn’t believed I could write about these wild places. I wouldn’t have gone to Alaska if the company hadn’t felt I needed to experience Alaska in order to write about it. And in the midst of all that wilderness and writing, I happened to run a 5K. So, yes, I believe in dreams fulfilled. I believe in stepping into openness even when—especially when—it’s scary. I believe it is the only way to the thing we know we want. Dedicated to the people and places of UnCruise Adventures. It’s taken me a long time to write about Kentucky. I just haven’t known how to tell the story. In fact, I often get stuck with how to tell, or rather live, the right story. Sometimes I get paralyzed and keep as many stories going as I can for fear of committing to one. It’s why I try to keep friendships with many different people. Friends who are reliable and friends who live more whimsically. Those who share my delight in making plans and those full of last-minute fun. Younger friends with dreams and wild ideas and older friends with inspiring life lessons. It has been the same way with jobs. Even after I switched from education to writing and marketing, I tried to keep my hand in English as a Second Language by volunteer tutoring, serving on an ESL board, and scoring TOEFL tests on the weekend. I still score the tests. I just can’t let it go. But I wonder if sometimes I keep telling (living) the stories after they’re over. I’m afraid to close the book, or even a chapter. And so that brings me back to Kentucky, a state I ran in nine months ago, to decide—for now—the story. This is what happened. I was in Kentucky with my boyfriend Chuck as part of a bourbon trail trip—a week’s work of tastings and tours, rolling green hills, and hot, sticky runs. One morning in Bardstown I went for a run I planned to be my Kentucky 5K. I remember it was hot, my gray tank top clinging more to my back with each stride. Bardstown is a small town with all the charms of old homes, wide streets, parks, schools, and the ease of seeing all of these on one 5K run. But after jogging through town, I still hadn’t hit 5K. 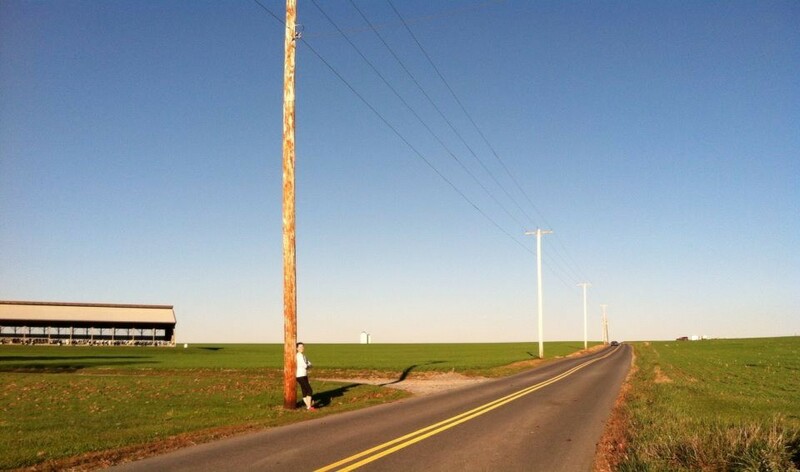 So I started running out of town—up a hill past farms wrapped in white fences. There on the fringes of town I found the quintessential Kentucky moment. I stood in front of a white fence with horses and blue hills in the background and took a selfie in the morning sun, assuming this would be the run I would write about. The next day Chuck said he wanted to go for a run together. I thought, “Why not? There’s no reason I can’t run twice in Kentucky, back to the beautiful blue hills lined by white fences.” I wanted to share that place with him. We did the same run, past the old homes and wide streets right up to the same fence. We took the same photo I’d taken the day before alone, but together. It wasn’t the first time I ran with Chuck (see Tennessee and Minnesota) and I don’t think it will be the last. It’s simply another story to add to the book—chapters of running alone and chapters of running with another, all part of this Kentucky Woman’s story. I expected Minnesota to be like Iowa. Not just because they’re both in the Midwest, but because they’re both other-side-of-the-Mississippi runs. Even though Iowa was on a cold, cloudy morning, and Minnesota would be a warm, sunny afternoon I imagined I’d have similar experiences in the two states. The difference came because I had a partner. In the past three months my boyfriend Chuck has joined me to run in three states. He’s a runner too and has his own project of ascending every state high-point, so joining me in my journey is a natural fit. In fact, I could easily see him joining me for the next eleven states. I could also see one of more of those states as girls trip or even a solo adventure. That’s the fun of this project: I never know exactly what the next state’s travel and run will look like. Sure, I started with places I wanted to visit and then made plans but I’ve never planned more than a handful of states ahead. What’s more exciting is that once I’m in a state, as well-planned as a run can be, I can never quite picture the route. I’d run the National Mall I’d seen in pictures and accomplished tons of courses I’d plotted on Google maps, but truly seeing each step of the route is usually not possible. Not until Minnesota. When we got out and started to run I thought what it meant to know exactly where I was going. On one hand, I knew to watch for those beautiful houses and sunflowers I’d seen from the car. On the other hand, I thought I might get bored because there would be no surprises on the run. Then I thought—more symbolically about my relationship—what it meant to know where I was going with no surprises. So much of life is uncertain, especially right now when the person running the country launches one fury of hatred after the next. It would be nice, for the first time in a romantic relationship, to know that I had someone I could count on in the midst of so much uncertainty. Whether or not Chuck runs with me in the next 11 states, trusting that he’s with me in life is a comfort I’ve never had before. That peace of mind was far greater than the physical sensation of running. It was hot, sticky, and the huge slab of award-winning frozen chocolate mousse pie I’d enjoyed just an hour earlier was not helping the situation. Still, would I rather run with a terrific partner after having a terrific piece of pie or run alone, without dessert, as I had so many times before? The answer was partner and pie for sure. For the last half mile Chuck and I ran alongside the marsh. It was still hot, the pie was still there, and to add to it we had to keep swatting little black bugs from our faces and arms. Then I looked at Chuck and he looked at me. Both of our chests were covered in bugs. When we got back to the car he dusted them off himself and I helped him brush off the bugs he couldn’t see. Then he did the same for me. So I guess I hadn’t known exactly how the run would be. Just because there are big houses and pretty gardens doesn’t mean there won’t be a swarm of nasty critters nearby. The best we can hope for is a safe place to run and a special someone to join us. Bugs are always around but pie and a partner make them a little more manageable. In my last entry on New Mexico almost a year ago I wrote about giving up a time goal to enjoy the experience of running. I reflected on the cycles of running and writing and the balance I wanted to create between the two. Like the 34 states before, I wrote about my love of travel to new places with friends. My previous entries reflected on relationships, career, and training. And while some posts were about the beauty and experience of the state I happened to be running in, they didn’t tie one state to another as a whole country. I think of this project less about running through the U.S. and more about taking one state at a time: crossing each bridge when I come to it. In Tennessee my boyfriend and I found an out-and-back trail that took us across a beautiful wooden bridge. Other than swatting the flies and bees that muggy morning, it was a pretty easy run. So easy that on the way back across the bridge I said, “Do you want to go fast?” We ran our hearts out across the final stretch because simply running was too easy. Even though we were hot and sweaty we sped across the bridge together because we had the energy to do so. We had “crossed the bridge” of complacent running to running fast and giving it our all. Since November I, like many people, have been thinking of the intolerability of the state of our nation. It reminds me of what my mentor teacher during my 6th grade student teaching used to say to misbehaving students: “I’m not ok with that.” When a student was out of line, she didn’t start by reprimanding the student or implementing a consequence. She first gave their behavior a value statement. By stating “I’m not ok with that,” she took a stance. In the classroom there’s no time to reflect on whether or not behavior is ok. It’s a moment-to-moment job and all eyes are on you. There’s no time to wonder what’s right and wrong—you know it in your gut and it’s your job to lead by example. In the “real world” outside of the classroom sometimes there is more time to decide what we’re “ok with.” It’s the way we shift our careers when a job becomes so intolerable we schedule informational interviews with dozens of one-off contacts in hopes that someday we will land in a role that truly matches our strengths and interests. I’ve done that. We decide what we’re ok with in relationships when we finally clue-in to the fact that a guy’s lag time in contact is just too few and far between to be a partner. I’ve been there too. Often, we think we have the luxury of time when deciding what is right. The other week on the bus I watched a fist fight that nobody did anything about. I looked around waiting for someone to step in: someone tall and built or a strong-willed pacifist on their way to a job at the non-profit. But nothing. My fellow wide-eyed bus-riders and I watched punches thrown and we watched each other. We tucked our earbuds in a little bit deeper. I couldn’t believe it. Then, something else happened during the fight that surprised me. When the woman seated next to me leaned away from the fight towards me, I instinctively put my arm her. Then we sat there for another 30 seconds, maybe a minute, while the fight broke up. All three men fighting got off the bus. I was relieved, expecting that the bus driver would yell at them or the police would come. But nobody came. As far I could see the driver said nothing. Most appallingly all three of these men got back on the bus. The driver still did nothing. This is America now. This is what happens every day. People display unacceptable behavior over and over again and we watch, feeling powerless or maybe just plain terrified. We wonder, “How did we get to a place where this is ok?” “Why do the people in charge not do anything?” This happens in blue and red states, in the most expected and unexpected places. A week after I wrote this paragraph, Charlottesville happened. I know it’s pretty likely that if you’re reading this you too are not ok with the way things are. I know we each have our own ways of coping and making a difference. I know there are many organizations doing amazing things to oppose the leadership and policies they too are not ok with. I did a little research and I like how South Poverty Law Center explicitly names the hateful and unjust attitudes and behavior they oppose. So, I ask you to join me in donating to this organization who addresses the “not ok” feeling because we’re on this bus together and the wheels are off the bus. What does a “not ok” feeling have to do with running? Maybe running is a way to deal with things you’re not ok with. I’ve run because I wanted to be faster. I started running a 5K in every state because I wasn’t ok with my career, romantic relationship, or where I lived. I ran to help make them ok. I’ve taken my “not ok” feelings one step, one mile, one state at a time. And four years later, all three of those things got better. But now here I am at 37 states panicked at what is next for our country. We’ve crossed that bridge–I guess we crossed it a long time ago. Join me in picking up speed and giving it our all. New Mexico was the only 5K in 50 states that was a 5K race, not just 3.1 miles logged on the clock. Usually I wouldn’t sign up for a race that short but the gals I ran with in Santa Barbara were planning a running trip to Santa Fe for a long weekend. Running in a new state with fun ladies? Sold! Then I decided to up the ante. Like the half marathon in Florida, I decided to run this race for speed. I’d been in good shape and had added barre3 workouts to my routine over the summer. The time was right to go fast. I chose a very aggressive time goal—so aggressive I won’t even name it–, a 12-week training plan, and got going. I felt great. Yes, it was really hard to hit the pace on both tempo runs and speed work, but it was the right time for a challenge. I was happy in my job and relationships. Training was the place where I pushed myself to discomfort. I made it to week 8, right on track, and then I got sick. The hardest part about being sick wasn’t being absent from and making up work, missing and rescheduling social plans, or vomiting across my living room floor and then picking out grains of rice from my white shag carpeting. It wasn’t even not being able to run. The hardest part was missing the training, knowing that I would have to forfeit my time goal. The ability to meet my goal had been taken away from me. I knew there would be other opportunities to run a fast 5K but the loss of that opportunity made me think about how closely I pay attention to and value time. As a former teacher, and coming from a family of former teachers, time is often top of mind. Both my mom and I break down household activities, be it cleaning the kitchen or leisurely (on the clock) reading, into 15 minute increments. Even things I do for fun are tracked, which explains why it was so satisfying to train for a time goal. But because I got sick, my training was on-track until it wasn’t. Time is everything to me until it can’t be. As for New Mexico, here’s why time didn’t matter at all. I’d been so focused on time I hadn’t thought about the time…..the experience…..I would have in New Mexico. The first surprisingly cool thing about the trip was just days before, the photographer who shot my barre3 photo session said she was doing the same Santa Fe race with her girlfriends. All nine of us would also be on the same flight. The scene at the Seattle airport wasn’t just a reunion with my girls in the running group but a meeting with my new photographer friend and her three friends, all of who were named Jane. Even before the plane took off we were gaggle of happy ladies seeking joy and serenity in Santa Fe. By the time race day arrived three days in I was already in awe of the brown adobe houses with blue doors, blissfully appreciative of our hotel’s complimentary kickback (happy hour) with a three drink limit, enchanted by the bundles of purifying dried sage at the farmers’ market and, well, over the moon after gazing upon the harvest moon the first night of the trip. I was convinced there was magic in the air. But there was nothing magical about the race itself. The four of us running the 5K dropped the two doing the half marathon off first. Just 20 minutes later we had parked our rented minivan in the casino parking lot and lazily sauntered over to the starting line. That took three minutes. There were no lines at the port-o-potties. Chilled by the early morning air, I was still wearing a floral Old Navy blouse over my running shirt. We heard the announcer queue the seven-minute milers and chuckled, “not us.” And then people started running. Not seven-minute milers but everyone. We laughed at how anticlimactic it all was as we tried to weave into the running crowd. I mostly kept pace with Lisa while our friends Helen and Christina popped up ahead and behind us. I don’t know why I hadn’t looked at the course map and elevation during my training but not even half a mile in I was simply elated that I wasn’t running for speed. Instead, I was keeping pace with a friend. I wasn’t listening to music. I heard every scuffle, shuffle, pant, and breath of those around me. The air was incredibly dry and cold yet I was sweating a lot. The course was on a sidewalk so narrow that you could only run two people across. Over-zealous kids pushed past us in a flurry of scuffling shoes and then suddenly stopped to pant and walk. The course was hilly; not rolling hills but out-of-nowhere steep hills. And then there was the small matter of 7,000 feet altitude. It would have the worst possible race to run for speed. But because I’d let that goal go I was thrilled just to be there. So I kept that silly Old Navy blouse on for as long as I wanted because a sleek, streamlined look no longer mattered. Instead of being absorbed in a carefully curated playlist I kept pace and chatted with Lisa the whole way. I never walk hills in a race–it’s usually my time to shine–but I walked those hills without a care in the world. I don’t even remember crossing the finish line. What I do remember is watching other runners. Us 5K gals cheered like crazy when our friends Carrie and Liz crossed the finish line. Because we’d now made new friends with Sherry and the Janes we also waited for them to finish and gave them our support. We didn’t stop there. While waiting for our troupe of women we saw so many other incredible runners. Lisa and I laughed over how emotional we got. We decided the only way to avoid getting choked up was that no runners who were holding hands, carrying American flags, over 60, or finishing the race with their kids should cross. Each triumph made us tear up. Other than the fact that I had run in my 36th state, none of those triumphs were mine and that felt just right to me. A few hours after the race I sat in our hotel’s rooftop hot tub alone. I rested my arms on the edge and stared off into the hills while the cathedral bells chimed. Later, a few of us walked a couple blocks to see the oldest house and the oldest church in the country. We couldn’t believe they were here in Santa Fe after remembering all the sites we’d seen in New England. Yet it explained why the area felt so rich in history, colors, textures, and spirituality. That afternoon the whole group went to Ten Thousand Waves, a Japanese spa specializing in Shiatsu. I’d never had Shiatsu before but as soon as I was introduced to my “handsome massage therapist Luke,” I knew I was in for a treat. Shiatsu cuts the massage “foreplay” as I called it, going right to the muscles from the first touch. I was surprised at first but tried to relax into Luke’s touch. Maybe my body hadn’t needed to go fast. Maybe it needed to receive touch from someone who seemed to know more about it than I did. How did he know the areas that were tight and how far they could stretch? How did he know the parts of my body that had hurt the most when I was sick? When he’d finished he said, “I’ll leave you for a moment and then sit you up.” Then he came back, folded my legs, cradled me and lifted me to sit up right. It was one of the most thoughtful, gentle touches I have ever received. That last day in Santa Fe I wandered through downtown. I talked travel with an owner of a gem store where I bought a small ball of copper for joint and arthritic health and a piece of raw turquoise because it seemed more beautiful than the polished kind I had seen in the shop windows. I spent a long time in a poster shop looking for a perfect sun-bleached arts festival poster from the 80s like the ones my grandpa used to have. I did find a lithograph of a gorgeous sunset but the “energy of the purchase” didn’t feel right. Lastly I stopped in a fetish store I’d wanted to check out– fetish meaning a small carving by the Zuni native people of New Mexico. I bought a carved stone bear by an emerging artist, the son-in-law of an established artist who happened to be standing right beside me in the shop. I walked out of the shop completely at peace, holding my bear which I learned symbolized both courage and safety of the journey and the power of hibernation and looking within. When I returned home and went running for the first time in Seattle, I noticed how very different it was from Santa Fe. On that first Seattle run I passed mostly men, most who were in a great hurry and/or looking at their phones. I didn’t see anyone holding their phones on the streets of Santa Fe. In fact, it seemed like there were fewer men in Santa Fe. In techy Seattle the buildings I run by are silver metal and stone, a sheen dulled by the gray skies. In Santa Fe, from the adobe to the dirt to the wood and sagebrush, there were rich textures. My second night home I remembered that Natalie Goldberg, my favorite author on the craft of writing, lived in Taos, New Mexico. I quickly pulled four of her books off my shelves and furiously flipped through for any mention of the New Mexico. There was her home in Taos and the Lone Wolf Café in Santa Fe where she once wrote. Then the two lines that have always stuck with me: “Runners write. Writers run.” In other words, do the thing you don’t always do so that you become better at the other. I had been so focused on running for speed I’d forgotten how rewarding it is to simply be in a new place so that I could write about it. After days of cloud-gazing, margarita drinking, gal pal giggling and wistfully looking a Georgia O’Keeffe paintings I’d found “the other.” Finally I felt like I was both a runner and a writer. I had fourteen more states and a lifetime of travels to be both. I’d been looking forward to running in Colorado. I was staying with a high school friend and her family in Denver. Since I’d had to drive a couple hours and back to do my cross-the-border Wyoming run the day before, running from right outside their front door would be a welcome treat. To sweeten the deal, their neighborhood of Stapleton, the flat site of the old airport terminal, is built around Central Park. No, not that Central Park, though in some ways it was similar. This Central Park was also rectangular, had a few hills, waterways, intersecting paths, and plenty of drinking fountains for the hot morning run. All I would have to worry about was the altitude. And after my first altitude run the day before in Wyoming, I felt ready—so ready that I thought I’d throw another variable into the mix. I’d run with my friends’ Labradoodle Chloe. I’m pretty picky about my pooches. I’ve never had a dog and tended to either adore or despise friends’ dogs. Nevertheless, Chloe seemed pretty chill. My friend Laura told me to give her leash plenty of slack and not to wrap it around my wrist, just in case she ran off. If another dog approached us she suggested I simply try to ignore it and Chloe would do the same. “Don’t led her lead you,” she said. It all seemed like rather profound advice, veiled in dog-walking speak: “give others space,” “don’t hold on too tightly,” “don’t channel your energy into unwelcome distractions,” “lead your own life.” Chloe and I started down Laura’s charming tree-lined street in a jaunty walk, both of us (I assumed) eager to be out in the sunshine doing our thing. Not even three houses down Chloe paused, sniffed around the grass for what seemed like forever and relieved herself. “Is this how it’s going to be?” I wondered. After a stop at the trash bin I resolved that in running, as in life, the only way to know is to begin and see. We did begin and Chloe didn’t pause again for the entire 3.1 miles. She had so much energy, such bright eyes and spirited swagger, that I understood why so many runners were lured and kept running because they have to give their dogs a workout. She was motivating me. Sure I thought about the altitude and the heat but much less so because I was hyper aware of her safety and enjoyment. I had a responsibility to Chloe. Suddenly my piddly little 5K in 50 states wasn’t the big thing. The big thing was keeping up with this dog. That was a side of running I’d never experienced before. And as I thought about how different it was to run with a dog I started to think about how different everything in Denver, specifically Stapleton, was from my life in Seattle. The first difference I noticed was the climate. I’d never been to Denver, or even Colorado, and I couldn’t get over how bright it was. We’d had a few sunny weeks in Seattle but they was nothing compared to the bright sun of Denver. Maybe it was that mile-high altitude, but I truly felt closer to the sun. The air was dry like Phoenix but the land was green like Seattle. I kept thinking about how I really was in the middle of the country because it reminded me of other places I’d been to north and south. Even Laura’s neighborhood of Stapleton couldn’t have been more different from my neighborhood and many parts of Seattle. Instead of cars parked on both sides of the street, playing chicken and waiting out one car after the next, Stapleton’s arterials seem to stretch for miles, with no parking problems. Instead of hills, Stapleton was flat, reaching to the distant Rocky Mountains. One could truly run for miles. The whole neighborhood was dotted with parks and swimming pools families could walk and bike to. In my neighborhood in Seattle, families seem hidden. Because it’s crowded with businesses, trendy restaurants, and homeless people, those children’s voices are a little bit harder to hear. The streets of Stapleton were nothing but families. Within those wide, flat streets were rows of well-kept houses with well-manicured lawns and flags waving from the front porch. After looking at the bright lawns I told Laura I felt like I was in the movie Pleasantville or at Disney World’ Main Street USA. I called it idyllic. Laura smiled, knowingly, that of course nothing was ever perfect. I knew that too but it looked perfect. I couldn’t believe any place could even look so idyllic, even if it wasn’t on the inside. We spent the evenings eating dinner on the back deck with the kids and then sipping Colorado beer on the front porch as the nights turned cool. As often happens when I visit high school friends, I reminded Laura of funny stories from the past and tried to better understand their life in Denver. I wanted some clue as to how I could apply what worked in family-focused Stapleton to my single girl life in Seattle. “How’s your commute?” “Do your friends smoke pot?” “How much has the property value increased?” There was so much to learn from a family of four, but translating it to my world would be difficult. Or maybe not. Turns out we are sort of the people we were in high school, there are just a million tiny choices in between. It’s easy to get stuck on the irreversibility of those choices. You can’t go back in time anyway. But, on that run in my 35th state I thought about the billions of lives happening across the country and how it was so good to experience a life different from my own, even for a few days. Married or single, parenting or childfree, suburbs or city, sunny or rainy, we all could stand to learn a few lessons from running with a high-energy dog. Don’t hold on too tightly. Don’t put your energy into unwelcome distractions. Most importantly the lesson that only Chloe could teach: Running is fun. Remember to have fun. I looked down at her happy trot, tugged her leash, and led us down the path. My trip to Colorado and Wyoming came at a time when I needed to get away. My summer had been a frantic cycle of new guy, running, work, friends, barre3, and whipping up pasta salads and baked goods just in time for the next party. Some days the cycle had my head spinning: each one of those activities, with the exception of running, was with people. Don’t get me wrong, I’m not complaining about being able to spend time with people I enjoy. There was no ‘woe is me.’ But there was a need to have a little space, to experience a life different from my own. A need to be in a place where the skies were bluer, the sun was hotter, the air was drier, and–most importantly—where everything felt simply open to my whims of the moment. That place turned out to be Wyoming. I started running through the parking lot, past facades of old west buildings and alongside a trailer park. “Maybe this won’t be so picturesque, after all,” but I trudged along, fighting the higher altitude and repeating the idea that you just never know where a run will take you. Just then the gravel path led through an open gate and down a green hill perfectly situated underneath the blue sky dotted with cotton puff clouds. It looked too beautiful to be true and definitely too beautiful to be open to the public. I took a quick glance behind me. Nobody was there so I kept running. A few minutes in I heard a couple of ATVs approaching. My neuroses kicked in again. I was sure they would ask me to get off the trail. Instead, I let them pass while they just smiled and waved. It seemed that this trail really was mine so I continued on. Not worrying about if it was ok to be on the trail gave me the space to address the altitude. My pace wasn’t that slow but everything was just a little bit tougher. Breathing was labored but, ironically, that was ok. It actually felt better to struggle with the most basic function of breathing than the struggle I’d had of keeping up with my summer schedule. I ran along a creek with cattails peeking out of the water. I passed rusted fences tilting downward to the dirt. Four horseback riders trotted along in the distance. I thought about how very alone I was. I hadn’t been so fulfilled in weeks. And yet there was only space all around. It hit me, like the catch in my breath from the altitude: I’m an introvert. If you know me, depending on how well you know me, that might come as a surprise or no surprise at all. Introverts don’t hate people. Many are very social but they are able to be because of being alone. They recharge by being alone. The difference between extroverts and introverts is that extroverts receive energy by being with people whereas introverts receive energy by being alone. On that run through the rolling hills of Wyoming I could feel my energy well filling up. It was such a simple thing to create and take time to be alone and yet I hadn’t really done it for months. I liked the people and activities in my world, so my tendency was to take in as much of that as possible. But it had left me depleted. Running alone between the green hills and blue sky for just 30 minutes put me back at equilibrium. After the run I was fully charged to enjoy visiting the ranch animals, going on a bison feeding train, and even trying a celebratory bison burger. When I went back to my friends’ home in Denver that night, I was exuberant. Two days after I returned from my trip I got sick and was consequently stuck at home for over a week. In the midst of being sick I broke up with my boyfriend. All of a sudden the busy cycle of exercise and fun slowed to a complete halt. In a way, it was as if my body was saying, “not yet, you need to be alone a little bit longer.” And despite being the sickest I’d ever been, there was something oddly comforting about the forced solitude. I didn’t fight it. I let myself recover and simply be single again. I did the one thing I couldn’t easily do in Wyoming: breathe.